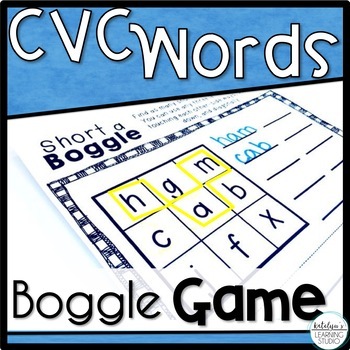 Want a new, fun way to practice making CVC words? 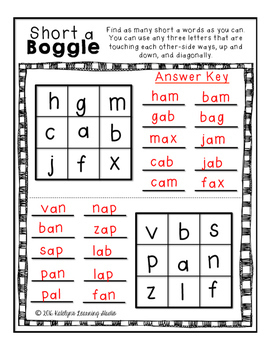 Students love playing this CVC Boggle game, and actually have fun while they practice their beginning reading skills. 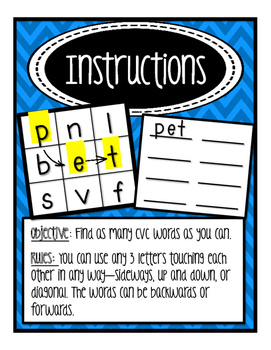 Students look for CVC words (3 letter words with a vowel in the middle) and write them down. They can use any 3 letters that are touching each other in any way--sideways, up and down, or diagonally. The words can be forward or backward. 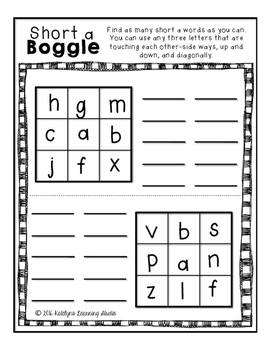 This can be used as a word work centers activity, individual seat work, fast finisher, or even homework. • New products in my store are 50% off for the first 24 hours they are posted! CLICK HERE to follow me so you don't miss any new products or sales. • Did you know with each purchase you make, you can earn points towards free products on TPT? For each product you provide feedback for, you earn 1 TPT credit for each dollar it was worth. After you make a purchase, hover over "My TPT" and click "My Purchases". Click "Provide Feedback" by the green little thumb. After you provide feedback, you can check your TPT Credit Balance by hovering over "My TPT" and clicking "TPT Credit Balance". Such an awesome way to save some money! Happy shopping!